I was born in Inglewood, California on November 7, 1955. It was a great place to grow up. My Mom played piano and ukulele and my Dad played clarinet, so music was around me from an early age. As a kid my mom played Robert Goulet and Peter, Paul and Mary albums. On February 9, 1964 the Beatles first appeared on Ed Sullivan and it was a major moment in the life of this 8-year old. As the years past, I picked up the ukulele and then the guitar. I started writing songs at Lutheran High School, Los Angeles and performed Beatles, James Taylor and Simon and Garfunkel songs for my school mates. In the Fall of 1973, I arrived at Calvin College, Grand Rapids, Michigan and started to really develop as a guitar player and song writer. I really liked the finger picking style of people like James Taylor and John Hartford, so early on I started to differentiate myself from the other guitarists on campus who were pretty much strummers. In 1977, I did my first full-length concert at Calvin College's Fine Arts Center. It was mostly an acoustic guitar affair, but we ended the night with a rock and roll medley, and that was sort of the Birth of the Tonedeafs. After college I returned home to California, but each Spring I would fly back to Grand Rapids, pull the band together and do the show. In 1980 we had our first sold-out show and we were getting a lot of local airplay. The "Misled" Album was recorded in 1980, followed by "Album" in 1981. While a few of the players changed, the basic nucleus of the band was Pete Bardolph - Electric Guitar, Doug Bardolph- Bass, Jack DeBoer - Drums, Steve Asskink - Piano, and myself on acoustic and electric guitar and banjo. The shows developed with more players, videos, and special effects. By the late 1980's we were selling out two nights at the Fine Arts Center and adding a third show. I kept writing songs about California, Calvin, my faith, and girls. The posters from those concerts were take-off's on whatever was happening in the culture at the time. In 1986, I met Jana and we were married a year later. The shows continued through the 1990's. Three more albums were recorded. Three children were born. Jobs changed, but the shows continued, and in 2007 we had our 30th Anniversary show at Calvin in the quaint Ladies Literary Club. In 2008 “Glenn Bulthuis and the Tonedeafs Greatest Hits (1977-2007) was released. In 2009 we started to depart from our typical concert format and we pulled together a series of “tribute” concerts. The Music of the Beatles was quite a popular show which we performed a number of times around the West Michigan area. This was followed up with The Music of James Taylor show and most recently, The Music of Simon and Garfunkel was performed at the Van Singel Fine Arts Center in June of 2016. In 2012 we released an original Gospel album called “Gloryland” inspired by the music of Motown and growing up around gospel music in Los Angeles. We’ve had a chance to perform these songs at Calvin as well as a few concerts in Los Angeles in 2013 and 2014. 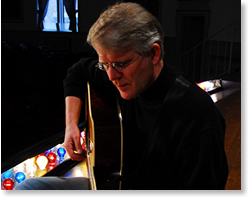 I continue to make music and lead worship each week at the Oakhill Presbyterian Church in Grand Rapids. In addition to work at the church, I continue to do solo performances, small combo performances and concerts using up to 20 musicians. Through it all, it's been a great way to bring friends together and laugh about our college days and life in the U.S.A. Each concert is a mini-reunion for friends who have been following us since the 1970’s. Thanks to all of you for your friendship and support. I was born in Inglewood, California on Nov. 7, 1955. I first saw the Beatles on February 9, 1964 on the Ed Sullivan Show and that event would prove to have a profound effect on the musical direction of my life. Soon I was playing guitar and writing songs. I attended Calvin College in Grand Rapids, Michigan in the 1970's and started doing concerts there in 1977. I've come back 25 times over the past 35 years to do concerts there and we've recorded seven albums (four of them live concert albums). Through it all it's been a great way to bring friends together to laugh about our college days and life in general.